NOTE: PenPlace has just been sold for development by Amazon. Stay tuned for more information. A working group consisting of representatives of ARCA and AHCA, County staff and Vornado will meet Jan 9 on the PenPlace Design Guidelines. (after this goes to press). Since the approval of PenPlace in September, 2013, County staff planner Jason Beske reports that they have worked with Vornado to make revisions to the urban design and the architectural guidelines. Input by the working group will be considered in the final version of the design guidelines submitted by the applicant Jan 21, 2014. PenPlace SPRC Meeting, May 20, 7 pm at Aurora Hills Community Center. The 13th meeting of the SPRC on the Pentagon City PDSP (Site Plan # 105) was devoted to transportation and traffic concerns related to the PenPlace development. A month before this meeting, a joint letter from AHCA, ARCA, and Crystal City representatives was sent to County planning and transportation staff outlining the community’s concerns, regarding the impact of PenPlace and other planned development in the 22202 area and including a proposed action plan which representatives felt would address those concerns (link). Steve Cole, Chair, introduced the committee members and county transportation staff, including Dennis Leach, Director, Wayne Wentz, Traffic Engineering and Operations, Steve Del Giudice, Transit, Rob Gibson, Transp. Planning, and Lynn Rivers, WMATA. Steve Cole announced that Mr. Leach would make a general presentation, followed by questions from the committee, and then an opportunity for audience members to ask direct questions of staff, partly in response to community frustration with the lengthy SPRC process, in which the community has observed, but has not been able to participate directly. Mr. Leach’s presentation was a broad overview of current demographics and future projected growth in 22202, including the street network, transit, commuting patterns and travel in the region and in the R-B and J-D corridors. He outlined county goals of improving street safety and walkability and emphasized various improvements underway in our area, such as the current Hayes Street MultiModal project. He presented a map of traffic count locations and an updated chart of traffic volume count data on a selection of local streets in Crystal City, Pentagon City, ARCA, and AHCA; it did not include the additional streets/counts requested 1/15/13. In discussing the transportation planning for PenPlace, Mr. Leach referred indirectly to items in the letter, such as concerns about accountability for TDM reductions, overall 22202 planning, and the impact of the projected number of trips on local arterials and streets. However, he did not respond directly to the specific points in the community’s action plan. AHCA representative Mike Dowell requested that staff respond to all points in writing. Questions to Mr. Leach, Mr. Wentz, and Mr. Del Giudice from the committee, and then from individual residents included questions about the role of the Columbia Pike Streetcar, concerns about heavy traffic on particular neighborhood streets not on the original list, tour buses idling for extended periods and insufficient bus parking in general, the dangerous and failing 23rd & Rt. 1 intersection, limited route choices for ART Buses to get in and out, lack of capacity on the Blue Line to absorb future growth, and the fact that there is currently no mechanism to hold the developer accountable if TDM measures fail to achieve the 60% reduction assumed, resulting in more daily SOV trips than estimated. The communities were pleased to have some opportunity to speak directly to staff, but remain skeptical about transit capacity, future traffic growth and its impact, and wish to have an opportunity for a small working meeting between transportation staff and community representatives. The communities were promised a written response to the proposed action plan but as of this writing have not heard from the county. The communities surrounding and including the PenPlace site — Crystal City, Aurora Highlands and Arlington Ridge Civic Associations — have identified many transportation and traffic related issues for discussion during the Site Plan Review Committee process. Under the signatures of all three, they have sent a letter and proposed action plan to Arlington County’s Department of Community Planning, Housing and Development that identifies specific concerns with the traffic and transit related studies provided them by the County. Their action plan identifies concerns, discusses potential transportation related impacts and provides possible actions for County implementation to mitigate the transportation impacts. The community recognizes that our zip code, 22202, is at the beginning of a long-term redevelopment with at least two projects under construction, two approved and two under active review. The action plan requests that the County identify specific transportation plans that will be implemented to address needs as the build out occurs. These plans may include Metro capacity and access, VRE capacity, MARC train service, ART bus service, the streetcar, regional bus service, shuttle bus service, car shares, roadway improvements, traffic monitoring and control and bicycle and pedestrian infrastructure. The PenPlace Site Plan Review Committee (SPRC) met in Shirlington on March 18th. The location was unfamiliar, and the cold rainy weather contributed to a sparse turnout. At the three hour meeting, height and massing were discussed; the all-important density issue was considered but not concluded. Height and density will be discussed at a future SPRC meeting. The developer made a brief presentation of a slightly different optional way to develop the site — however, this is an option and the basic application has not changed. On April 29th the 12th SPRC meeting participants looked at open space, parking spaces and street presentation. The re-scheduled May 20th meeting on traffic, see details above, will consider issues from ARCA’S, AHCA’S, and CC’s letter and accompanying traffic issues. ARCA received a response from Arlington County Planning staff to the PenPlace questions posed by those attending our March Membership Meeting. The answers are being reviewed by ARCA and can be found on our website (link below). Mr. Duffy, Arlington’s Planning Director, has indicated a willingness to meet and discuss the answers in more detail. That leads to the Good News part of the update. Our messages, is actually getting through! At the February PenPlace SPRC meeting the County staff actually came back and recommended the PenPlace proposal be changed in three areas as recommended by ARCA residents: 1) Provide one residential building to enliven the site (although they call this an option we want it a requirement); 2) at least 1 acre of active park space; 3) modify the plan to secure buildings (although they would allow up to one under certain conditions). Believe me, until our community started putting up signs, came out 200 strong to a meeting with Bard Members Tejada and Hynes, and wrote what I can assume to be hundreds of letters, there was no sign of changes coming. It was because we came together as a community that they had to listen, so take pride in what we have done. But we need to keep up the work. The concessions thus far are the easy ones for the County to make, what we really need them to do is to reduce the request for huge office density and 300’ heights to protect the character f our Community. And most importantly they must reduce the huge projected increase in traffic. Those issues will all be discussed in the last 3 SPRC meetings over the next few months then a Planning Commission meeting followed by the Board Vote. Letters and emails now will help get the changes we need, and attending as many of these meetings as possible will show them we will not give up. Issue: PenPlace development will forever define our community… it is up to us to make sure the changes are positive. ‘PenPlace’ is a proposal for a huge secure office development on the 9.2 acre vacant lot northeast of Costco.Current zoning on the site allows only residential and hotel development; if approved, PenPlace would include nearly 2 million square feet of office space plus a hotel and retail. Current zoning limits the heights of office buildings to 12 stories, about 150 feet tall; PenPlace will have up to two 300 foot high buildings. Twice as high as the Marriot Residence Inn that sits on the corner of the site. In spite of proximity to Metro, the developer wants a huge number of parking spaces: 2,235 spots. The developer’s own studies indicate that PenPlace will generate 6,800 daily car trips on neighboring roads. PenPlace creates a mega block of government offices: the same type of bad planning seen in Crystal City circa 1970 which Arlington is currently spending millions to repair. In early 2013 the County Board will vote on these significant changes to zoning to allow for this enormous increase in density. If approved as is, it will have negative effects on our neighborhood, and set precedent for future development. No. Since Metro was developed in Arlington in the 1970’s, our County has prided itself on practicing ‘Smart Growth:’ regulating and encouraging development along Metro Corridors to reduce car travel, encouraging mixed use development to create vibrant live-work-play communities as opposed to the deserted, dark at night and weekends, office-only developments that characterized Crystal City and Rosslyn. Most importantly, Arlington has made it their priority to ensure development would not adversely impact adjacent single-family-home neighborhoods. In 1976, Arlington collaborated with our community to produce a master planning document to govern development of Pentagon City. This document, one of the first of its kind in Arlington County, is called a Phased Development Site Plan (PDSP). For over 30 years this PDSP has protected our neighborhood by preventing Pentagon City from becoming an extension of Crystal City. Now, a developer is asking that our PDSP be radically amended in order to build PenPlace. Isn’t someone from ARCA working on this? For two years ARCA has closely monitored this project; our representatives have spent hundreds of hours at meetings with various County Commissions and County staff to make our community’s concerns known. Arlington County Planning Commissioners and even staff have voiced many of the same concerns as our community representatives. However, after two years of County processes and community input, there have been NO CHANGES to the original proposal for height, density, number of parking spaces, and the right to build four huge office buildings two of which are secure office buildings. If it is so bad, why would the County Board approve this plan? If the County Board awards Vornado, the developer, the rights to this project, they have offered, in return to pay the County $20 million to complete the swimming pool at Long Bridge Park. The developer has also offered the County a small piece of land across the street from PenPlace for use as a trolley maintenance facility. The County will extract money for affordable housing, street improvements, and a commitment to build an energy efficient building. And merely by rezoning the site, the property will instantly increase in value — even before the buildings are erected — and thereby provide increased tax revenue. This may be a particularly attractive incentive to the County Board, because a few years ago they earmarked property tax increases in Pentagon City to a special fund that the County plans to use to fund the proposed trolley in Crystal City. In principle extracting benefits from developers for extra density is a good idea. However, in this case, our community is being targeted for huge development but all the extracted benefits are being targeted toward other Arlington County communities. Our community’s needs and rights are not being considered in the PenPlace plan, and have been ignored in the County processes to date. What do we want to see in the plan? What we want is simple. We want true smart growth; the same sort of careful planning enjoyed by the rest of Arlington County. We want mixed-use with at least one residential building, to activate the site on weekends and evenings. We want to limit secure buildings to one building and locate it on Army Navy Drive; this would allow the interior of the site to be activated for the benefit of the community. We want one acre of park land on the site, and we want it to include recreational space for neighbors, children as well as office workers. We want a 24/7 medical facility to address the severe lack of medical services in our end of the county. We want to limit the height of the buildings to less than 200 feet to remain compatible with surrounding buildings. We want to limit the parking and require proactive mitigation of the impact that increased traffic will have on surrounding neighborhoods. And, most importantly, we want to make sure this is not a precedent, and prevent our neighborhood from becoming the County’s dumping ground for intense development density. We need you to stand up for our neighborhood. Over the past few years the County has projected that the vast majority of future development will come in the 22202 zip code. In 2010 the County Board passed the Crystal City Sector Plan exponentially increasing the heights and densities in Crystal City. The first of those buildings (the largest building in northern Virginia –other than the Pentagon) was just approved. And more buildings are in the pipeline. One of the reasons we may be seeing so many projects approved here that go above the zoned density is frankly that other neighborhoods have been much better at pushing back on increased commercial development or extracting a higher price in community benefits. If we want to minimize the impact of future development and have True Smart Growth—the kind that does not come at the expense of the surrounding neighborhoods— then it is up to us to let our County Board know that we expect reject projects that fail zoning and smart growth standards. PenPlace is not Smart Growth! The 7th Site Plan Review Committee (SPRC) met at the Aurora Hills Center on October 18th for another nearly three hour marathon session. Vornado presented further descriptions of how PenPlace might look if Vornado’s proposals were adopted. Unlike other meetings, Vornado’s representatives seemed to talk a little less, and County staff a little more. Members of the SPRC engaged in a lengthy discussion of various points such as density, heights, aesthetics. TDR’s, use, etc. While previously the staff had indicated there would be one more SPRC, at this meeting the number of future SPRC meetings seemed to be an open question. Two years ago in September, the PenPlace plan and numbers were submitted to the County, which started the public review process. So this is an anniversary of sorts. We thank all those who have worked on this issue; your efforts are important. s concerned about many aspects of this proposal. What would an ARCA newsletter be without a PenPlace article? We have been reviewing and responding to the PenPlace application for two years — it was filed in September, 2010 — so honoring these two years seems appropriate. Happy Anniversary! What has been accomplished during those two years? You probably have the numbers memorized. The developer, Vornado, wants the right to build nearly 1.9 million square feet of office, a hotel and some retail with more than 2200 parking places. This gigantic increase in density and office use, once given, can’t be removed. So far Vornado has not made any significant changes to the proposal. During year #1: Vornado made presentations at two ARCA meetings with lively informed discussions at each. ARCA took a position in opposition to the PenPlace development during the second presentation because of concerns about excessive density, significant additional office use, precedent, zoning and General Land Use Plan, traffic and air and noise pollution. (Later ARCA indicated its willingness to consider an alternative while presenting a modified PenPlace position with a power point presentation at a Site Plan Review Committee meeting.) The Long Range Planning Committee (LRPC) of the Planning Commission met five times in an effort to develop Guiding Principles for the project. ARCA members submitted extensive comments to the LRPC and staff about the proposal. During year#1, information, data and research were part of ARCA’s reflective and analytic work. During year #2: In November, the County Board held a work session to review the process and provide suggestions to Planning Commissioners before the next phase was started. ARCA was invited to make a statement and took the opportunity to make serious and thoughtful remarks. ARCA also submitted significant questions to the County, which were eventually answered but raised more issues. The LRPC was disbanded and in its place, the Site Plan Review Committee (SPRC) was started. Because of the large community interest in the project, meetings at which over 100 people often attended were held at the Aurora Hills Community Center. This attendance number is a great tribute to the neighborhood’s concern because no attendee was allowed to speak. Unlike standard SPRC meetings there is no detailed site plan. The developers seek the right to build and the detailed site plans would come later. ARCA made a power point presentation about the development and a possible improved, less dense development, and because transportation is so important a meeting was held with some particularly active folks from the neighborhood. By the time you read this, another SPRC concerning transportation will have been held. Numerous letters and emails have been sent to the County Board and County manager. Neighbors have attended PLACE meetings and made calls to officials. Significant data has been obtained and analysis conducted. We ask, please, that you keep up the good work in the form of letters and calls. The additional density of PenPlace will further impact our neighborhood and create significant precedents. We have laid out and expressed our concerns on many fronts. Are County officials listening? PenPlace Report – Molly Watson gave an update on the status, noting that the SPRC process thus far has been dominated by the developer, with insufficient County staff response to planning concerns expressed by Commission members at meetings. She reiterated that the proposed changes to the PDSP will, if approved, allow approximately 1.8 million sq. ft. of new development, new office density not allowed under current zoning, with at least one 291 ft. building, one or two secure office buildings, 2300 parking spaces and potentially 6800 daily car trips. David Litman spoke in response to a question about traffic impacts, explaining briefly what a Traffic Impact Analysis is, and how the County evaluates traffic around new sites, emphasizing ARCA’s concerns about impacts on major arterials and Metro stations, and consequent spillover onto other neighborhood streets, such as Eads and Arlington Ridge. The topic for this meeting is continuing a review of the site. Vornado has developed some guidelines which will further delineate some of the urban design elements. For example, we should get more information on heights: our basic questions regarding density, height, use (residential, hotel, office, retail), transportation, infrastructure, remain and will be part of the dialogue. The staff has chosen to defer planning proposals to the developer for which they provide a staff report. This area is still being designed as a compound and not a community. It has also been referred to as a “business district.” Despite this endurance contest, community involvement continues to be strong with another excellent turnout at the June SPRC meeting. Many thanks to everyone who is supporting this effort by attending the meetings and/or writing letters. Letters can be sent to the County Board with copy to the county manager. At the June 11th SPRC meeting Vornado proposed two new possible designs for the enormous density increase they are requesting. Basically building heights would increase to accommodate a little more open space. For example, a private office building at Army Navy Drive and Eads would be 22 stories rather than 18 stories in the earlier proposal. The 18 story building would be 239′ feet plus HVAC and Penthouse. The developer hasn’t made clear how tall the higher building would be. Another scenario with one secure office increases the open space a little more, but then increases the height of a proposed 3rd private office building where the 2nd secure office would have been. Several SPRC members suggested the Planning Staff offer a proposal of its own rather than the developer always presenting his, and also suggested putting residential on the parcel 1D. Despite this endurance contest, community involvement continues to be strong with another excellent turn-out at the most recent Site Plan Review Committee (SPRC) meeting. Thanks to everyone who is supporting this effort by attending the meetings and/or writing letters. The plan is a long way from ARCA’s presentation at an earlier SPRC meeting to build a community not a compound. Several SPRC members suggested the Planning Staff offer a proposal rather than the developer always presenting proposals. Some SPRC members suggested putting residential on the parcel 1D. The next SPRC meeting will be July 16 at 7pm at the Aurora Hills Center so please mark your calendars and plan to attend! We still do not know the topic but will let you know when we know! 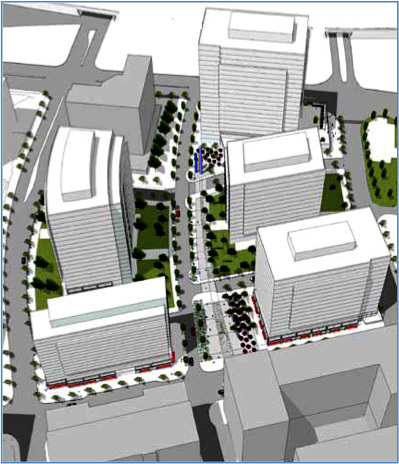 The precedent-setting nature of allowing nearly 300’ tall buildings in Pentagon City. Far from the very limited areas in Rosslyn and Crystal City where the county has approved such heights in the past. The development of a secure office compound encompassing 6 square blocks — rather than the mixed use residential area required by the Pentagon City PDSP and anticipated by the community. The lack of community amenities on the site, including the 1-acre park and child care facilities planned in the original PDSP. It’s hard to imagine the County Board approving this type of development in any other neighborhood in the County. It is our opinion that the only reason it is being considered for Pentagon City is a lack of understanding that this is a real neighborhood, home to thousands of families, a point we that was amplified by the large audience representing single family homeowners, condo owners, and renters. There will be at least four more meetings on PenPlace before it goes to the County Board: tentatively scheduled for May 14th SPRC, June 11th SPRC, July 5th Transportation Commission, July 16th SPRC so mark your calendar and plan to attend. Also, please consider contacting the County Board and express your opinions on PenPlace. The County Board can be reached at countyboard@arlingtonva.us, address your letter to any or all of our Board members: Mary Hynes, Chris Zimmerman, Jay Fisette, Walter Tejada, Libby Garvey). Although the Board vote on PenPlace will not be until the fall, letting them know there is community concern now is our best chance for modifications to the proposal. If you would like more information on PenPlace, contact MollySwatson@gmail.com. A historical overview of the Crystal City Redevelopment Phased Development Site Plan.